Caravans of migrants from Central America’s Northern Triangle. More than five million Syrian refugees outside the country’s borders and more than six million internally displaced within Syria. A recent surge of violence in the eastern Democratic Republic of the Congo drives large numbers of Congolese eastward to neighboring Burundi, Tanzania and Uganda. The rise of populism and right-wing parties in Europe in response to migration. The growing securitization of migration in the U.S. The 2018-19 EPIIC topic is “Migration in a Turbulent World”. Migration has become a worldwide phenomenon and its importance today is clear. Concerns with the demographic, economic, social, security, legal and political consequences of international migration have also increased. Discussions on issues such as national security, xenophobia, racial discrimination, social integration, unemployment, brain-drain and brain-gain, human trafficking, and asylum claims have led to a reexamination of international migration policies and the potential benefits and disadvantages to sending and receiving countries. Some states are questioning whether migration can bring benefits and opportunities to all parties –migrants, states of origin, states of transit and receiving states. With the attention now paid to counter-terrorism and violent extremism, cooperative efforts to address national security concerns posed by the movement of people has become a pressing issue for both receiving countries and countries of origin. The second semester will focus on migrant and refugee narratives, exploring the experiences and voices of those in transit. The class is studying this theme with a range of guest lecturers, including Andrea Capachietti, a humanitarian aid consultant and university lecturer on global health and refugee resettlement issues with a particular focus on women’s rights and child protection; Zoltan Feher, a former diplomat from Hungary and a Ph.D. candidate in International Relations at The Fletcher School of Law and Diplomacy at Tufts; Noora Lori, Assistant Professor of International Relations and Founding Directorof the Forced Migration and Human TraffickingInitiative at the Frederick S. Pardee School of Global Studiesat Boston University; William Moomaw, Professor Emeritus of International Environmental Policy at The Fletcher School of Law and Diplomacyat Tufts; Adlai Murdoch, Professor of Francophone Studies and Director of Africana Studies at Tufts andthe author of Creolizing the Metropole: Migratory Metropolitan Caribbean Identities in Literature and Film; and Amb. Lamberto Zannier, the OSCE High Commissioner on National Minorities and the former OSCE Secretary-General, 2011-17. Contributing to this year’s class discussions is the diversity of places from which this year’s students hail: Brazil, China, France, India, Pakistan, Panama, Switzerland, and the United States. 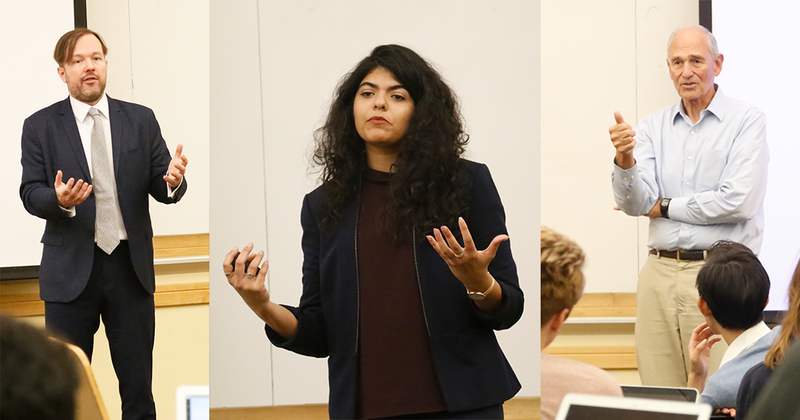 Alumna Kerri Sherlock Talbot (EPIIC’96) was the guest lecturer for EPIIC’s Annual Immersion Weekend, this year held in Ashland, MA and focused on “Immigrants and Refugees: The Tension between Protection and Migration Control”. Kerri is Director of Federal Advocacy at the Immigration Hub where she works with non-profit organizations and Congress to promote the fair treatment of immigrants and refugees. She was previously a Partner at the Veng Group, a government relations firm, where she assisted non-profit organizations and businesses. From 2009-14, Kerri served as Chief Counsel for U.S. Senator Robert Menendez of New Jersey. She staffed the Senator on the Gang of 8 and assisted in writing the comprehensive immigration reform bill which passed the Senate in 2013. Coming out of the weekend, she has also designed an internship with her organization in Washington, DC for an EPIIC student. In the midst of the first semester, the students are also working in their committees: the Program Committee is working to define the themes and speakers for the symposium; the International Students Committee is establishing a website and readings to interact with the more than 40 international students expected to attend from Argentina, Brazil, Canada, China, France, Ireland, Israel, Japan, Kenya, Russia, Singapore, and South Korea; the Inquiry Committee is working to determine the outline of the simulation and roles for the more than 25 delegations of high school students; and the Voices from the Field Committee is exploring the possible themes to gather mid-career alumni around to discuss best practices.